In pursuit of its ambitious “Greenest City” goal, Vancouver has had to knock down old buildings, gut others, and raise sleek sustainable towers. Spearheaded by the municipal government’s left-leaning council, the city has set itself a 2020 deadline to achieve its green badge of pride. One strategy in its “Action Plan” is to push the construction of LEED-certified projects. LEED – an acronym for leadership in energy and environmental design – is an international point-based rating system used to grade a building’s excellence in sustainability in seven areas, from water and energy efficiency, to material selection and innovative design. Four ascending levels of certification are possible: certified, silver, gold and platinum. In Vancouver, all new building rezoning must score between 60-79 points to reach a minimum Gold standard. But no official record of total certified buildings and renovations is kept by City Hall, according to media spokesperson Viviana Zanocco. But an online ledger updated on July 31, shows Vancouver has 224 projects approved by the Canada Green Building Council, the certifying body that oversees the national LEED program. Though many of the city's new multi-unit residences and large-scale construction projects make a hard sell of their Gold and Platinum eco-credibility, LEED isn't a popular choice with single-family homes, said Bryn Davidson, co-owner of Vancouver-based Lanefab Build/Design and LEED-accredited designer. “From my experience, there hasn’t been a lot of uptake or at least demand from homeowners who are looking to do it,” Davidson told HuffPost B.C. Because the Canadian rating system is an adaptation of the U.S. Green Building Council, Vancouver designers are looking south to cities with similar climates to gauge LEED pickup among homeowners. "Talking to builders in Seattle, I get a sense that there's starting to be more interest on the residential side." Cost may be a factor among some Vancouver homeowners. Every new house in the city is required to get an EnerGuide score – a measure of the home’s energy efficiency – and few, if any, homeowners are willing to pay expensive LEED-certification fees, which start at $6,000 for a standard review for homes 2,500-metres-squared and under. However, deep-pocketed projects and institutions keen on folding top-of-the-line sustainability and green selling points into their branding don’t think twice about the pricey review process. 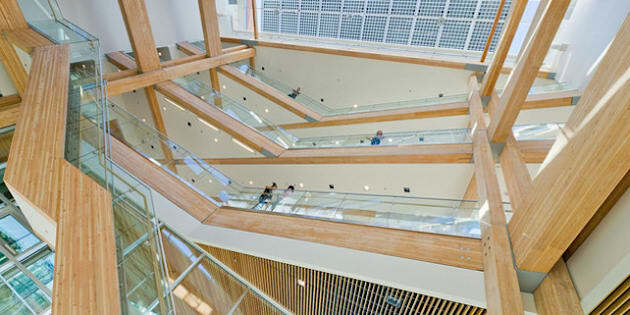 At the University of British Columbia (UBC), all new construction and major renovations must meet Gold standards at minimum. Currently, there are five LEED-certified buildings on campus, eight projects awaiting certification, and another six being built. Construction cranes have no doubt become a omnipresent fixture on its Vancouver campus. More green buildings, more eco-conscious students and citizens, right? According to researchers at UBC, just being in a green building can cause people to behave in a more environmentally conscious way. “A green atmosphere promotes more green behaviour. It’s almost like it’s in the air,” said Alan Kingstone, head of the university’s Psychology department to UBC Reports. Kingstone’s team studied people’s food-disposal behaviour in two campus buildings – the café in the LEED-Platinum Centre for Interactive Research on Sustainability (CIRS) and 1968-built Student Union Building (SUB) – with the same garbage and recycling options. “It’s a cultural thing. You pick up cues very subtly without even thinking about it. If you’re in an environment that reflects a sustainable way of being, then you yourself will behave in a way that’s more sustainable,” Kingstone explained.